First, Heinz revamped its ketchup packets. 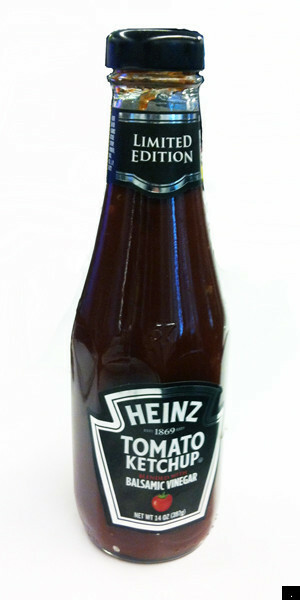 Now, it is launching a new ketchup variety that blends its omnipresent classic tomato ketchup with balsamic vinegar. This is the first new Heinz ketchup flavor variation in nearly a decade (remember the green and purple ketchup disasters of the early 2000s?). The company has no plans to advertise the ketchup and are banking on the power of social media to get the word out (newspaper articles probably don't hurt either). The balsamic vinegar ketchup (the classic version is made with white vinegar) will be available for purchase exclusively through the Heinz Ketchup Facebook page starting on November 14. Starting December 2011, the ketchup will be available in select retailers including Walmart and Safeway for a suggested retail price of $2.49. The Telegraph found the ketchup "genuinely sophisticated" with "a depth to it." HuffPost Food got our hands on a early bottle and we have to admit it's pretty good. It's quite a bit tangier than normal Heinz, with a more pronounced umami-based complexity. The addition of the balsamic vinegar tweaks the flavor in interesting ways without throwing the ketchup's flavor off balance. The color is much darker and browner than you expect from a ketchup, which could be off-putting to some. But as far as we're concerned, it's one of the best commercial ketchups out there -- and, having helped KitchenDaily with its recent ketchup taste test, we've more or less tried them all.